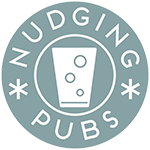 Pubs and bars operate on tight financial margins, in premises that may not have been designed for modern requirements. No two venues are the same. Depending on their location and their customer base, the demand for drinks will differ as well. The same applies to the market for non-alcoholic or low-alcohol options. Such variations also evolve over time, making generalisation even more difficult. 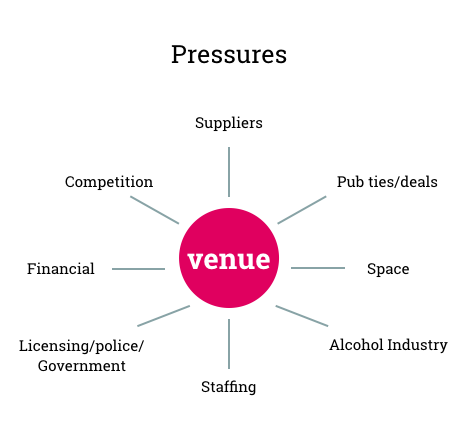 Throughout this project we had a close relationship with one licensee, who now manages two venues in Hackney. Through ongoing engagement and contact during the nine months of this project, we did manage to change her behaviours in terms of what she serves at her venues. We were able to track her journey and learn more about the barriers, opportunities and pitfalls. It was labour and time intensive. So in order to change the behaviour of larger numbers of venue operators, we will need to look for solutions that are more easily scalable. We also believe that deploying a number of behaviour change techniques will help achieve impact. 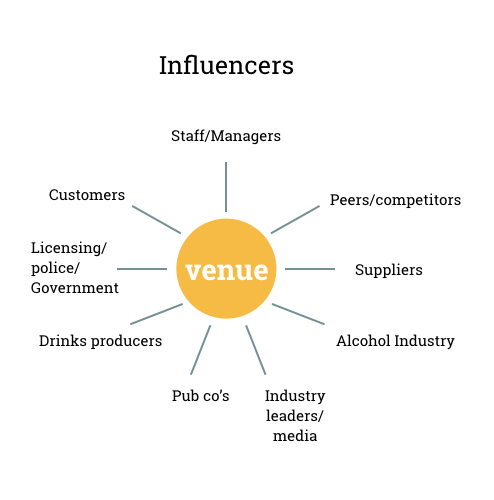 Above we outlined the key pressures facing licensed venues, but key to change is engaging as wide a range of the influencers as possible – whilst not covered in this study it would be worth capturing who the agents for and against change are and how to engage them.